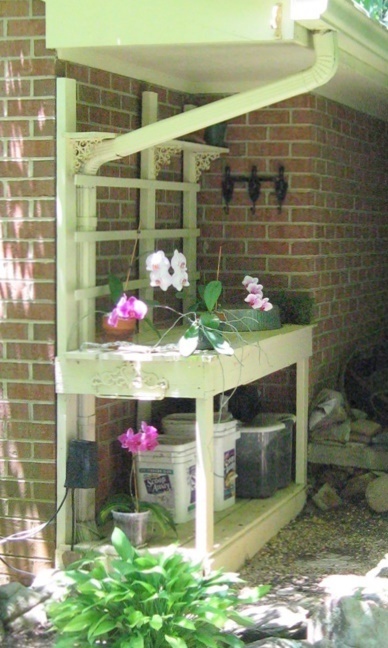 I saw the potting bench in the photo below during a garden tour last summer, and it really caught my fancy. I love the way it fits into this little nook that’s formed by the angles of the house, and the fact it’s sheltered by the overhang so that tools stay dry. It’s close to the back door, and there’s a water spigot right around the corner. It looks like there may even be an electrical outlet right there — what more could you ask for? I feel like this potting bench reveals the personality of its owner. Don’t you get the impression that this gardener is female? It looks to be quite solidly built, yet the cream-colored paint and the fancy, curlicued brackets lend a touch of romance and a decidedly feminine air, despite the rugged materials stored nearby. Want to spend a cold, wintry afternoon indulging your dreams of the potting bench? Pinterest is the perfect site for that, filled with photos of not only do-it-yourself constructions, but pre-made potting benches of all types that have been accessorized by their owners to make them both beautiful and functional. I noticed a couple of interesting themes while browsing potting benches on Pinterest. It seems a large number of people have recycled an old porcelain or stainless steel sink, dropping it into the surface of the bench to form a recessed work area that can contain soil and other messy materials. Others have used a reclaimed farmhouse-style sink as the whole potting bench, by setting it on legs or even mounting it to the side of a garage. Since I’m often guilty of using my real, indoor kitchen counter and sink as a potting area, I love these ideas! Another recurring theme is that of an old piece of furniture used as a potting bench, usually on a covered porch or patio. These benches have been made from tables, china hutches, and dressers or bureaus – often with the mirror removed and replaced with pegboard, chicken wire, or lattice panels for hanging tools. Clever! 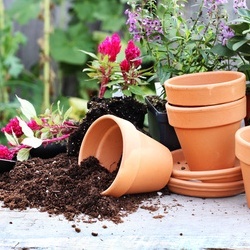 And if recycling, upcycling, or building it yourself is just not your thing, there is a wide variety of ready-built potting benches available for sale in all kinds of shapes, sizes, and materials – please feel free to start your search for the perfect potting bench right here at BluestoneGarden. Hilda Brucker is a garden writer based in Atlanta. Her articles have appeared in regional and national gardening magazines, as well as on the Web. ©2013 BlueStone Garden. Inspiration for Your Yard and Garden. (866) 543-1222 | BlueStoneGarden.com. Unauthorized use and/or duplication of this material without express and written permission from this blog’s author and/or owner is strictly prohibited. Excerpts and links may be used, provided that full and clear credit is given to BlueStone Garden and with appropriate and specific direction to the original content.